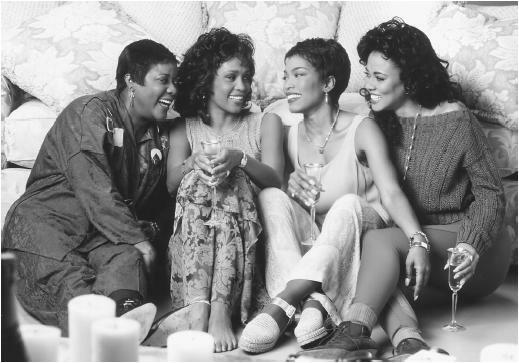 Acclaimed actress, Angela Bassett, sat down with Black Voices and gave an update on the status of the much anticipated 'Waiting to Exhale' sequel given the untimely death of megastar Whitney Houston. Last year Terry McMillian shared her thoughts on the sequel to “Waiting to Exhale,” and revealed that the film’s producers were still up in the air about Whitney Houston’s character, “Savannah Jackson.” What’s the latest status? They’re still writing. One of our original producers, from the first “Exhale,” is on board. So that’s a good sign, but they’re still working on the script. It’s just how to deal with it [Whitney’s loss]. And probably the best way to deal with it is just deal with it. It’s like what happens in life, in a way. Life is about life in passing, living and dying, winning and losing. So that’s what I know so far. If the producers decide to proceed with the storyline of “Savannah,” is there anyone that you would like to see play the character? Not off the top of my head. That would be interesting for the fans to decide. I wonder if they [the producers] have done any outreach that way. Who would the fans like to see, or what they would like to see. I don’t feel like replacing that character is the most respectful way to go, because in my heart I love Whitney and her work and the time that we shared together. Her role and her presence was just so important. I have a hard time replacing someone else in her shoes. I guess they wouldn’t have to do that. We would have to just come up with a brand new friend. Would you like to see the part of Savannah re-casted? If so, who would be your pick to play the part? I haven't watched Waiting to Exhale in its entirety in a long time. Personally I probably wouldn't be bothered with someone else playing Savannah. However, just out of respect, it makes sense to just create another character like Angela Bassett said.